Lance Armstrong is using his Tour de France apperance to promote the global fight against cancer. Through a Nike supported campaign at www.wearyellow.com there are a number of initiatives for people to participate, share their story and highlight the cause. 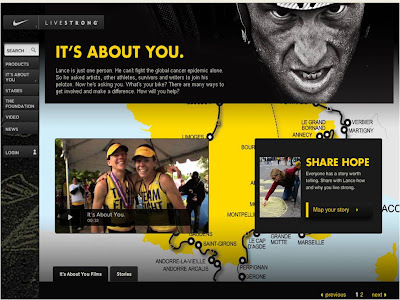 As the Live Strong site says: "Lance is just one person. He can't fight the global cancer epidemic alone. So he asked artists, other athletes, survivors and writers to join his peloton. Now he's asking you. What's your bike? There are many ways to get involved and make a difference. How will you help?" One of the ways to get involved is to send a message to the 'Nike Chalkbot.' The Tour de France has a tradition of people chalking messages on the road for riders to see and this year the Nike Chalkbot will allow people from all over the world to contribute a chalked message. Followers can send a message via SMS, through the Live Strong website or as an @ reply on Twitter (including the hashtag #livestrong) to @chalkbot. 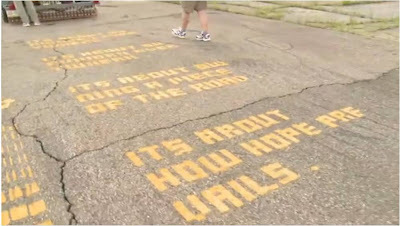 Once approved by the moderator, the message is then sent to the Chalkbot which then chalks the message onto the road ahead of the riders. The contributor is then sent a link to the message so that they can see it on the road for themselves. Lance Armstrong is a Tour de France legend and the Tour de France Live Strong activity is a great way of combining the event platform with technology to highlight the cause whilst allowing the global community to interact with the actual event.